The exhibition presents a body of artwork that has been developed over two years is titled Invisibly Visible. The exhibition explores the experience and design of the traditional Kuwaiti 'Abaya, a garment that has evolved into a public uniform for some Muslim women. Influenced by socio-cultural constructs, traditions, and religion, the purpose of this garment is complex, yet rooted within sacred privacy through protecting and obscuring the female sexuality. However, it has served the opposite as it has become a visibly recognized symbol of hidden female bodies as well as a politically stigmatized icon. The artworks that have been created and curated by the artist capture the garment in spaces of silence, reflecting on its ability to silence the presence of the body while also becoming an object louder than that silence by speaking its untold stories. 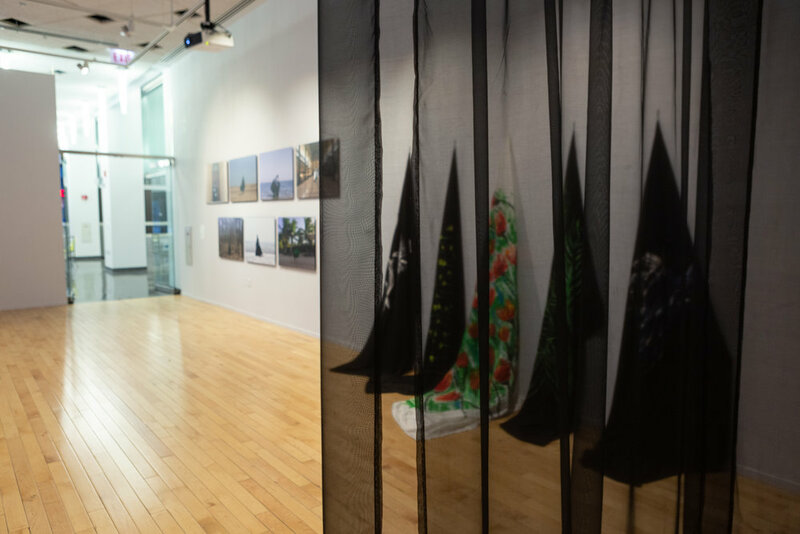 The exhibition and programing invites viewers to investigate the socio-political complexities of the 'Abaya. The six artworks in the exhibition are Disclosed (2016-Ongoing), Visibility (2017), Untold Stories (2018), Samri Within (2018), Caustic (2018), and a Poetry Collection audio/booklet (2018). The exhibition extends to three programs, an opening event with live music, a panel discussion around veiling/concealment, and a Samri dance workshop.